The cost of producing and distributing Eastleigh Borough Council’s ‘free’ newspaper “Borough News” has been revealed in response to a freedom of Information request. The 12 page newspaper is produced six times a year with 48,000 copies per edition, but only costs £30,000 to produce and distribute – much cheaper than the newspapers produced by most other local councils. The cost is also further offset by £5000 worth of advertising. However Eastleigh council tax payers also have to contribute towards the quarterly County Council produced magazine ‘Hampshire Now’ which has been revealed to cost a further £350,000 a year. 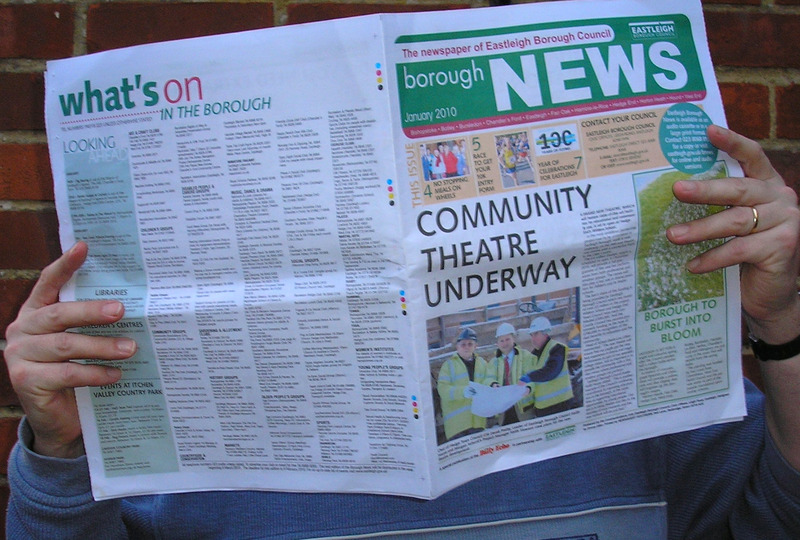 Borough news is published in partnership with the Daily Echo – dubbed by some as ‘The Delhi Echo’ after parent group ‘Newsquest’ sent its pre-press production work to India in 2008 with the loss of 30 local jobs, in order to cut production costs. I am amazed you could find anyone in the Borough who actually reads or admits to reading this ‘Lib Dem Propaganda Rag’. Instead of giving us news about our community, it is filled with stories about ‘Lib Dem’ councillors and their ‘so called’ good deeds and even more surprisingly our very own ‘Lib Dem’ MP gets good coverage in its pages, even though he has nothing to do with Eastleigh Borough Council.!! I foolishly thought it was a council community based publication paid for by the residents of Eastleigh to keep us informed of local council issues. However, I am grateful to the Lib Dems for sending this paper out so often to me, all my neighbours collect them for me to use in my cat litter tray. Well done EBC, you have at least one resident that relies on your hard work and clever use of local tax payers money.